Get ahead in your program by enrolling in a four-week intensive course. The Summer Intersession term will begin on Tuesday, September 4, 2018 and end on Saturday, September 29, 2018. You may add or drop Summer Intersession courses through self-service in SOAR up until Wednesday, September 12, 2018 at 11:59 pm. You will receive a 100% tuition refund for any courses dropped by this deadline. If you have any questions, please contact the Registration Office at 925-969-3353 or registration@jfku.edu. For questions about degree requirements and study plans email academiccounselor@jfku.edu. For accounting questions, call 925-969-3160, email accounting@jfku.edu, or refer to the Managing Your JFKU Account Online – step by step guide. If you are a student that is returning to JFK after taking a break, join us for the General Student Orientations to learn more about JFK University’s resources and services. Online via Zoom – Wednesday, September 26, 2018 – RSVP HERE to receive the Zoom Link. In advance of your orientation session, feel free to watch the interactive New Student Orientation video to learn how to navigate the BlackBoard Learn and SOAR portals, register for classes, access important academic information and valuable student services and resources. Bring your questions! To access the video navigate to BlackBoard – Office of Student Experience – New Student Orientation (on the left hand menu). Email us at studentexperience@jfku.edu with any questions. Tonya Kent, a John F. Kennedy University student in the JD program, is motivated by kindness to share with members of her community most in need. 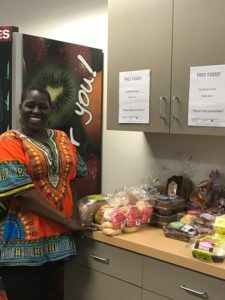 Every Thursday, during the school schedule, starting at 11:00 am, Tonya brings food to John F. Kennedy University which is donated by Trader Joe’s. Anyone at the Pleasant Hill campus can access this food for free at the Student Lounge. An assortment of bread, fruit and sweets are available on the countertop in the vending machine area. In her words: “I want the students to know that there is food, it is free and there is nothing you need to give back in return. You are loved even if I do not know you. You are not forgotten.” Click here to continue reading. Recent MA Holistic Counseling Psychology-Expressive Arts alum Leyla Eraslan and current student Camara Rajabari are co-chairing the next International Expressive Arts Therapy Association Conference in 2019. Way to go! For more details about the conference visit the 2019 IEATA Conference site. At the HRC Annual Symposium held Friday, June 1, 2018, the HRC was proud to present its 2018 Research Fellows, whose projects seek to work with communities to explore questions of mental health, violence, power, and the very concept of research. Sonia Cristina Suarez, a JFKU Adjunct Faculty member and UC Berkeley PhD candidate, discussed her research project, entitled Brujeria and Psychology: Healing Practices of the Ifa-Orisha Tradition, which will explore the influence of non-Western spiritualities on psychological wellness. Nancy Pederson, Community Research Fellow, shared about her experiences working with the Institute on Aging and how this inspired her project, entitled Power in the Voice of Elder Hispanic Women, which seeks to examine the impact of violence on Hispanic women over 60. 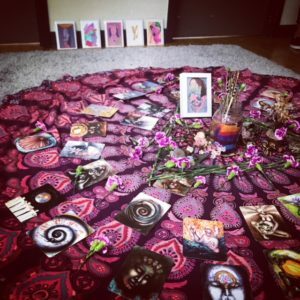 Conversations touched on the ways in which visibility and empowerment are, in themselves, therapeutic and restorative. If you’re interested in getting involved with the HRC, or supporting one of their research projects, contact Program Manager Leyla Eraslan at leraslan@email.jfku.edu. Check out the stunning pictures from the 2018 Commencement in the JFKU Website Photo album. Congratulations once again to all the graduates! We are pleased to introduce JFK University’s Job Portal powered by GradLeaders! This is an online system where all internships, jobs and volunteer opportunities are posted. Some of these professional opportunities are also nationwide. Through our centralized portal, you will be able to search for positions in your area of interest on a regular basis. Just log-in, update your profile, and go! Visit this link to find details on how to log in. If you have any questions, email Career Services at careerservices@jfku.edu. Sign up for free access to Office 365 online using your JFKU email! You will have access to use Microsoft Word (online), Microsoft Excel (online), Microsoft PowerPoint (online), and Microsoft OneNote (online). To set up your Free Office 365 Online account log on to office.com/GetOffice and enter your JFKU Student Email address. For questions or if you need assistance, email the IT department at helpdesk@jfku.edu. Grammar Workshop – Monday, July 30, 2018, 5:00 pm – 6:15 pm, Room S202 and on ZOOM (join here). We’ll focus on strategies for smoothing out your sentences and improving clarity. APA Basics Workshop – Monday, August 20, 2018, 5:00 pm – 6:00 pm, Room S202 and on ZOOM (join here). We’ll discuss strategies for avoiding plagiarism and using APA style with confidence and purpose. Writing center appointments are available in-person in Pleasant Hill and online via ZOOM. View the schedule and book appointments by logging on to BlackBoard – Office of Student Experience – Writing Center. Starting August 1, 2018 students will be able to check out books from the San Jose Library Research Center’s circulating library for longer period of time. Books that are required readings for the current quarter will still circulate for 1 week or 2 hours at a time (to give more students access). However books that are not required for a current class can be checked out for 5 weeks at a time, the same as circulating books from the Pleasant Hill Library. For more information about Library Services visit library.jfku.edu. Did you know you can access your grades, course content and more from your phone with the BlackBoard App? When prompted, select “National University System” to login via SSO. You can find all previous issues of the Newsletter on the JFKU Blog, The Kennedy League, under “Campus Life”.